What are tumor microenvironments made of? A tumor’s genesis is divided into 3 phases: initiation, progression, and metastasis. 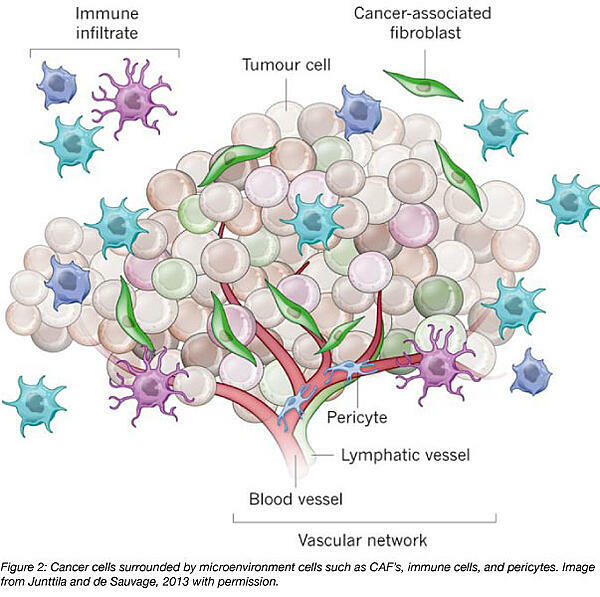 The microenvironment’s physiology is deeply connected to these 3 stages and contains multiple cell types: fibroblasts, myofibroblasts, neuroendocrine, adipose, immune, inflammatory, angiogenic vascular, endothelial, and stromal cells - a rich soup of life encircling the tumor. How do microenvironment enzymes and metabolic reprograming influence tumors development? Being pathological active regions, microenvironments shape a tumor’s evasiveness, evolution, and response to treatment. Some microenvironment cells improve tumor’s durability, while others repress it. Unfortunately, as a whole, microenvironments promote tumor durability instead of repressing them, making it even harder to cure cancer. To understand how cancer cells influence microenvironments and vice versa, let’s take a look at cancer cell metabolism. Cancer cells promote oxidative stress leading to the degradation of one key enzyme (among others): caveolin 1, also known as CAV 1. Usually, caveolin 1 promotes the cell life cycle progression and enhances tumor growth, so it would be expected that when there’s less caveolin 1, there’s less malignancy because there’s less proliferation. However, the lack of caveolin 1 in breast cancer also induces changes of stromal cells in the microenvironment. This results in increased expression of transforming growth factor-β signaling, possibly inducing the secretion of growth promoting proteins, such as human growth factor, vascular endothelial growth factor, and interleukin-6 (Witkiewicz et al., 2009) which contribute to the development and spread of cancer cells. Besides these stromal cell modifications, stromal cells are also constantly communicating with a tumor, proving once again that a tumor is always interacting with its surroundings and being shaped by them. Another set of highly influential microenvironment cells are Cancer-Associated Fibroblasts, or CAFs. CAFs are altered fibroblasts and promote the development and metastasis of tumors through inciting inflammation. Speaking of inflammation, a noteworthy cell type in the tumor microenvironment is the immune cells. The contradiction is strong in this one. After all, the system built to protect us now seems to attack us by releasing mitogenic growth mediators and improving cancer cells proliferation. How do microenvironments affect tumor spread and drug resistance? Although we’ve seen how multiple types of cells affect tumor progression, enzymes and metabolism reprogramming aren’t the whole story. It’s essential for a tumor to spread and to resist drugs. And to do that, let’s take a look at exosomes. Proficient in transportation, exosomes are tools of communication and provide malignancy to the microenvironment itself. They deliver compounds like proteins and nucleic acids from cancer cells to the microenvironment. This mechanism happens for both short and long distances. When it comes to breast cancer, Hoshinho and colleagues found that after injecting breast cancer cells into mice, exosomes expressed specific integrins (cell-adhesion proteins) targeting different organs. This means that exosomes not only promote microenvironment’s malignancy but also incite different organs to become malignant. Exosomes also contain miRNA (micro RNA) and other molecules that can be transferred to other cells, inducing epigenetic changes in targeted cells. In this case, exosomes may transport miRNA from drug-resistant cells to sensitive ones. Though this process is not fully understood, a team of researchers lead by Takayuki Kogure (Kogure et al., 2011) believes that miRNA may decrease the expression of TAK 1, an enzyme that controls apoptosis and regulates transcription. Without TKA1, cells proliferate and cannot undergo apoptosis, thus multiplying uncontrollably and building up tumors. Not all is bad news – we also have “friendly” cells in microenvironments! Take myoepithelial cells for instance. They retard tumor formation by inhibiting cell growth, invasion, and angiogenesis (Allinen et al., 2004). In fact, Sanford H. Barsky and his team tested the influence myoepithelial cells had on the conversion of non-malignant forms of cancer to invasive and malignant forms and noticed that myoepithelial cells prevented progression to malignancy, concluding that these cells may be considered "natural tumor suppressors." Ever since Stephen Paget’s “seed and soil” theory in 1889, microenvironments have started to gather attention. By the 1960’s, scientists have begun to understand two main areas of study that influence tumor microenvironments: immunology and angiogenesis (Witz et al., 2009). Then, scientists began focusing on the extracellular matrix and fibroblasts. With each cell mechanism discovered in microenvironments, we are one step closer to understanding cancer as a broad phenomenon and not only as an isolated disease. While the tumor may seem to take center stage in cancer development, the microenvironment backstage play just as important of a role if not more. Many thanks to our guest blogger, Bárbara Pinho! Bárbara Pinho is currently a science communicator at the Portuguese science museum "Fábrica Centro Ciência Viva" in Aveiro, Portugal. She is particularly interested in science journalism and writing about biomedical issues. Follow her on Twitter @BrbaraPinho6. Allinen, Minna, et al. 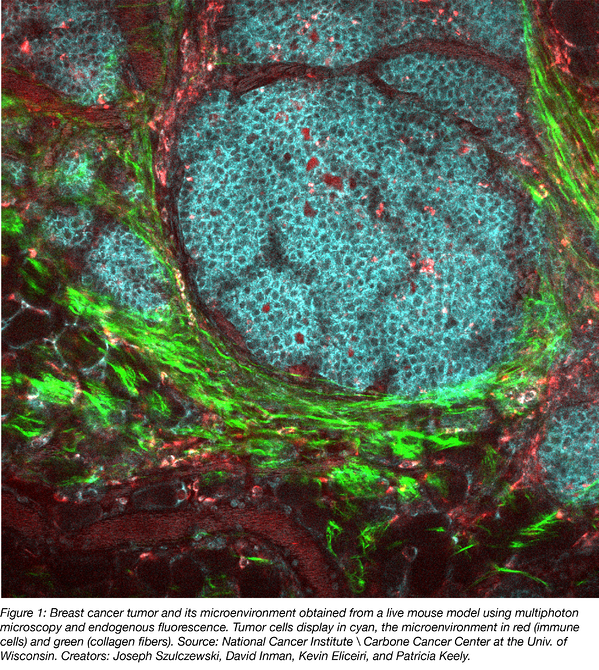 "Molecular characterization of the tumor microenvironment in breast cancer." Cancer cell 6.1 (2004): 17-32. PubMed PMID: 15261139. Barsky, Sanford H., and Nina J. Karlin. "Myoepithelial cells: autocrine and paracrine suppressors of breast cancer progression." Journal of mammary gland biology and neoplasia 10.3 (2005): 249-260. PubMed PMID: 16807804. Hanahan, Douglas, and Lisa M. Coussens. "Accessories to the crime: functions of cells recruited to the tumor microenvironment." Cancer cell 21.3 (2012): 309-322. PubMed PMID: 22439926. Hoshino, Ayuko, et al. "Tumour exosome integrins determine organotropic metastasis." Nature 527.7578 (2015): 329. PubMed PMID: 26524530. PubMed Central PMCID: PMC4788391. Kogure, Takayuki, et al. "Intercellular nanovesicle‐mediated microRNA transfer: A mechanism of environmental modulation of hepatocellular cancer cell growth." Hepatology 54.4 (2011): 1237-1248. PubMed PMID: 21721029. PubMed Central PMCID: PMC3310362. Martins, Diana, and Fernando Schmitt. "Microenvironment in breast tumorigenesis: Friend or foe?." Histology and histopathology (2018): 18021-18021. PubMed PMID: 29978449. Witkiewicz, Agnieszka K., et al. "An absence of stromal caveolin-1 expression predicts early tumor recurrence and poor clinical outcome in human breast cancers." The American journal of pathology 174.6 (2009): 2023-2034. PubMed PMID: 19411448. PubMed Central PMCID: PMC2684168. Witz, Isaac P. "The tumor microenvironment: the making of a paradigm." Cancer Microenvironment 2.1 (2009): 9-17. PubMed PMID: 19701697. PubMed Central PMCID: PMC2756342. Xing, Fei, Jamila Saidou, and Kounosuke Watabe. "Cancer associated fibroblasts (CAFs) in tumor microenvironment." Frontiers in bioscience: a journal and virtual library 15 (2010): 166. PubMed PMID: 20036813.